The Trevor Hardy trained Youwaitandsee is out to win the sprint named in his trainer's honour for a second straight year. VETERAN Coffs Harbour trainer Trevor Hardy is hoping history can repeat tomorrow. It was a year ago that the first running of the Trevor Hardy Sprint was raced to thank the man for not only the many years Hardy has been training at his trackside stables but also to honour a true gentleman of the racing industry. Lo and behold Hardy sent out one his own in Youwaitandsee and managed to win the race. The two will again be at the track for tomorrow's race meeting hoping to once again pull off a victory in the race that bears Hardy's name. Hardy admitted it's going to be difficult. 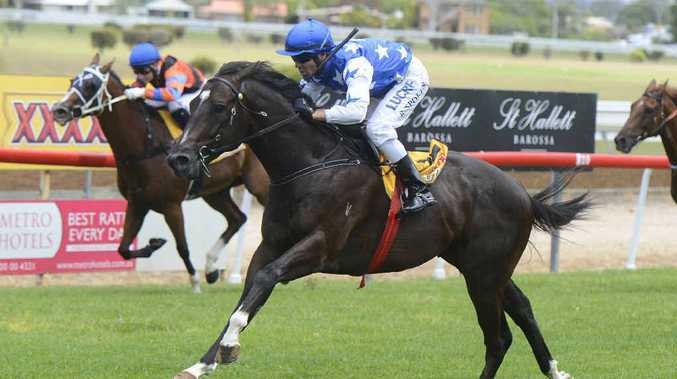 The Dane Shadow gelding won his last start at Grafton a fortnight ago but that was over a mile. Tomorrow's feature race is over 1,300m. The trainer said he's freshened the 6 year-old up since that win but said one thing Youwaitandsee has in his favour that might worry other trainers is drawing the outside gate. "With him I'll take that every time because he doesn't like being in between other horses. When that happens he can dig his toes in a bit and doesn't want to go," Hardy said. "Over 1300 metres at Coffs being on the outside isn't such a bad thing. "You've got a good run down the back with some time to go forward. By the time they get to the first turn he should be able to slot in somewhere nice." Hardy admitted Youwaitandsee is a terrible worker on the track but on raceday he just switches on. "He's a very difficult horse but he's got a lot of ability," the trainer said. "He's got to have the run of the race and be given room to run. "He'd be at the city all of the time if he didn't mind being in between other horses. He can run some phenomenal times over the last 600 but that's if the race is run on his terms." But how does Hardy feel about having a race named in his honour? "It's good really," he said. "Most of the time they don't do that sort of thing until after you're dead." Other Coffs Harbour hopes in the Hardy Sprint tomorrow include Zuccherina from the Brett Bellamy Stable, Sally Taylor's Lolly Shoppe and Not Wanted, trained by Warren Gavenlock who recently moved to the area.